Houzz 39 of our visitors have told a friend about this plan. To enjoy the pleasures of nature, there's nothing like this charming cottage with sloping ceiling in the front. It measures 20 feet wide by 24 feet deep and has a surface area of 480 square feet. This model has an open room which includes the kitchen, living room and access to a bathroom and a master bedroom. 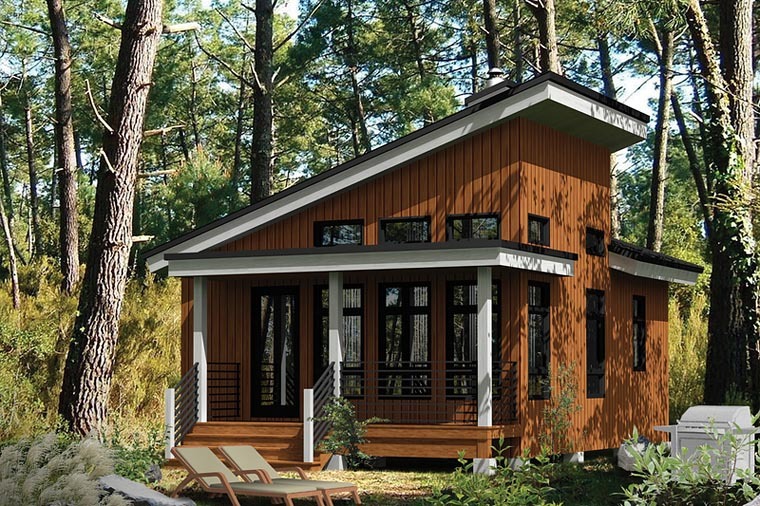 This cottage plan is designed with a concrete pier foundation. In other words, the insulated floor structure sits on top of concrete piers. Question: Is this plan stick frame or truss? Does it meet the national 2011 standard for electrical codes? Answer: The plans are drawn with 2 x 6 walls studs and the roof is made of engineered trusses. The plans are drawn to N.B.C. 1995. There's no electrical plan. Best regards. Question: What size lumber is used for the wall framing and floor joist ?? Answer: Greetings, The floor is made of 2 x 10 solid joists and the wall is 2 x 6 studs. Best regards. Answer: The ceiling is cathedral so the height starts at 8’-2” in the kitchen all the way to 14’-6” in the living room. In the bedroom and bathroom the ceiling height is 8’-2”. Question: Won't the flat roof over the deck collect rain/snow and eventually leak? Answer: If the construction of the roof is built according to standard practices and building codes it will not leak. 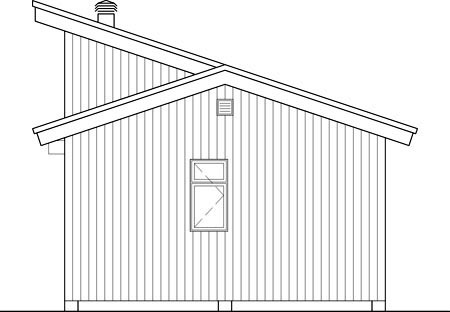 Question: How how are the two lower roofs? Can the upper roof be modified not to exceed 16' which is the maximum allowed for an auxiliary structure here. Answer: 16’ is too low for a house; but it could be modified by changing the style of the roof from a single slope to a peak roof and by cancelling the cathedral ceiling and the upper fixed windows.